Sunny Duplex located on Parlor and Garden Floors of historic brownstone (Central Heat & Air Conditioning). Parlor floor entrance opens to large living room, 13 foot ceilings, original moulding, window shutters, hardwood floors. Dining room is a continuum flagged by sweeping arch entry, mahogany built ins, antique furnishings. Large Chef Kitchen with all modern amenities (SubZero fridge, Garland Gas stove/oven, Bosch dishwasher, Marble counters, cherry custom cabinetry, large farm sink - note, NO microwave) leads to large glass double doors which give onto small wrought iron balcony overlooking private garden/deck with BBQ, cedar table/chairs, shaded by trees. Half bath with stylish Italian stone located off kitchen. Second entryway/landing with coat closet and staircase leading to Garden Floor bedrooms. The staircases have child gates for families with young children. The internal staircase has a 3/4 railing thus not ideal for guests that have ambulatory issues. Master Bedroom with King Bed, tin ceiling, large closets, Cable TV. Master dressing area with his/her mirrored doors/closets. Master Bath furnished with Italian stone, large glass shower and double sinks. Second Full Bath with tiled tub/shower, sink & toilet. Second Bedroom: Queen Bed, double dress closet. Glass double doors giving onto private garden. Third Bedroom: Twin beds with trundle, double closet. Hallway includes two linen closets and staircase leading to basement laundry area. Entryway to Garden Floor includes two steps from street. Dining Area is designed to be an open space to accommodate apartment life. The Antique fold out mahogany table has two end attachments and seats approximately 8 diners. Pads and tablecloths provided. Teak table with four chairs and cushions. PLEASE NOTE THAT GUESTS CANNOT ENTERTAIN LARGE GROUPS OF FRIENDS / FAMILY AT THE APT! THE APT IS NOT A RECEPTION/PARTY VENUE. A lovely Apt. with everything you need! I was looking for an apartment close my daughter so I could help with a new baby, and this was perfect. Before I get too far into how wonderful the apartment is, I have to mention Marion! I don’t know where to start. First she is absolutely readily accessible. She quickly accommodated me when the baby arrived 2 weeks early, quickly helped when I locked all 3 sets of keys in the apt., called Spectrum when there was a power outage just to make sure it wasn’t on the apt. side of things. Oh! And also supplied a microwave when I mentioned it would be helpful for my husband. I felt like I had a good friend in the city. The apt is very nicely appointed with a fabulous kitchen which I used a lot. Stores for groceries, wonderful restaurants, and nice walks are right out the door. I’m going to miss my home away from home in Brooklyn!! Clean, tidy, well equipped and maintained. Perfectly located to restaurants, cafes, shops and the Subway. 20 minute trip to Manhattan means close enough to do all things yet far enough away to feel relaxed whilst visiting the Big Apple. Our family of 5 adults were more than comfortable. Thanks Marion. We stayed here for a week in October and had a great time. The house was very clean, well-appointed, and is in a great location. It worked very well for our family of 4 and grandmother. The kitchen had everything we needed to cook meals, the living space was great for hanging out with family, the bedrooms were nice and quiet, and the neighborhood has a lot of great parks and activities for kids. Communication with Marion was great throughout the whole stay. We had a minor problem with the heating, but it was resolved very quickly and satisfactorily by Marion. Highly recommend. Great space. Clean, well organized, and great for kids. We loved our stay! Lovely home and beautifully decorated. Great location. Mrs Morrison was great to work with. Had a wonderful time and would love to stay again. Highly recommend! The perfect Brooklyn brownstone in the best location! This property in Carroll Gardens is absolutely wonderful! So beautiful and welcoming. It is quite spacious, quiet, comfortable, and so beautifully decorated! It has a spacios, private back yard/garden area which provides a nice place to relax after a long day of sight seeing. The kitchen is gorgeous and is equipped with everything you might need. The location is the best... just a short walk to the closest subway going into Manhattan and only a block or two from an endless array of bakeries, restaurants, grocery stores, delis — there’s even a medical walk-in clinic just a few blocks away. 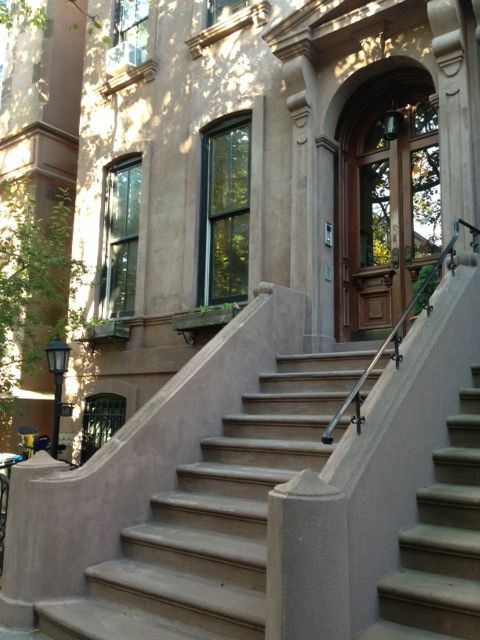 The owner of this beautiful, classic brownstone is very helpful and is very willing to help with any needs. We loved staying at this lovely Carroll Gardens property and hope to be back! Carroll Gardens is a charming, trendy Brooklyn neighborhood filled with boutiques, excellent restaurants, local Italian bakeries and delis. Family friendly area with playgrounds, outdoor cafes and quiet treelined streets. Only fifteen minutes away from Manhattan by taxi or subway. Maximum 6 people a $100 surcharge for 6th person.